Few things are as inspiring or majestic to me as the towering cliffs and canyons of Canyonlands National Park, Utah at sunset. 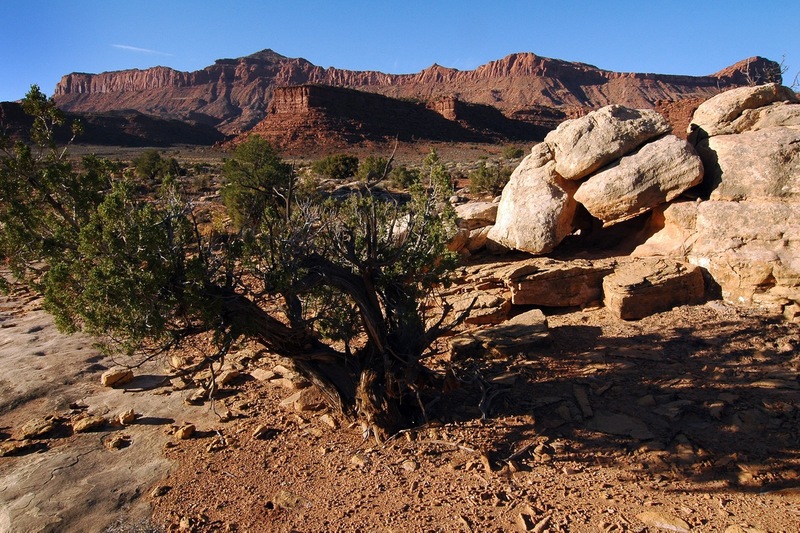 Evening light casts long shadows on this beautiful formation on the Lathrop trail at Canyonlands National Park. I spent the day on the road. I stopped and shot lots of fun stuff, but I didn’t do any hiking, since my plan was to drive straight through to Blanding, Utah, which took about 15 hours. 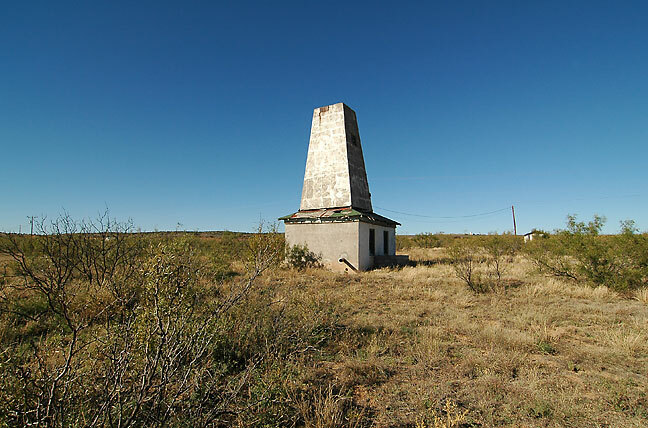 Concrete structure near railroad tracks just west of Tucumcari, New Mexico; I don’t know exactly what this is. Your host poses in Ding Canyon. 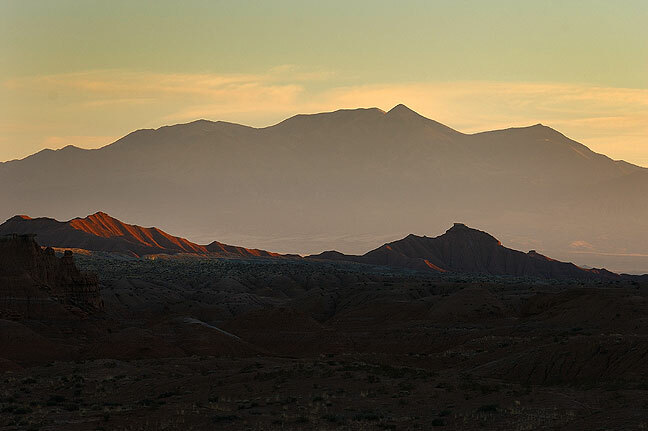 Monday morning I left Blanding before sunrise and headed west on the beautiful state highway 95, which cuts through Cedar Mesa, the Robbers Roost, the Glen Canyon Recreation Area, and the San Rafael Desert, all wonderful places. 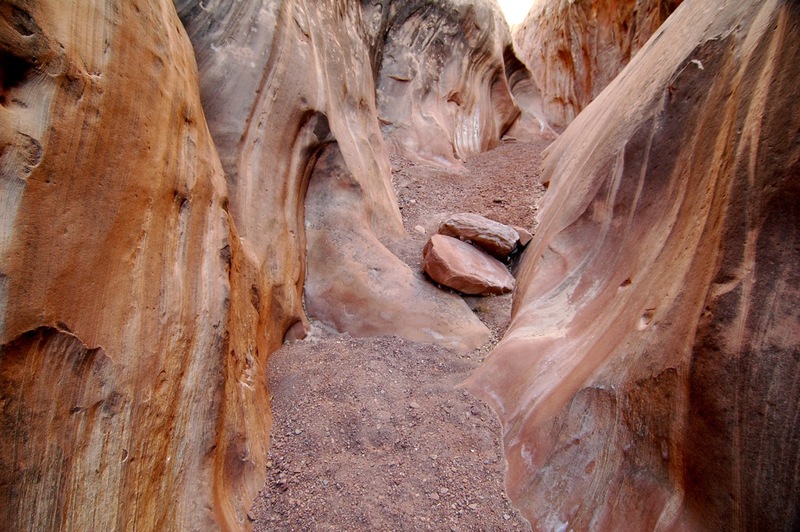 I stopped first at White Canyon, a deep gorge parallel to UT95, which is a notable canyoneering canyon. 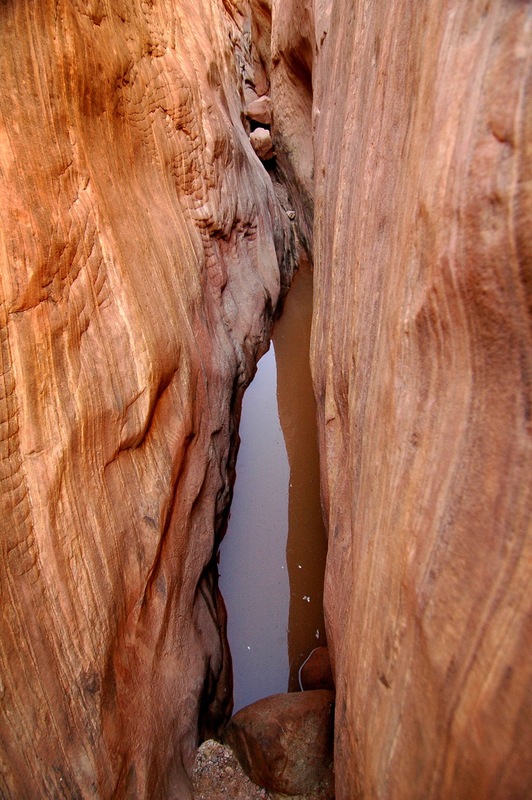 I am not a canyoneer, but I wanted to know what my web friends were talking about, so I decided to hike down a piece of it and see. 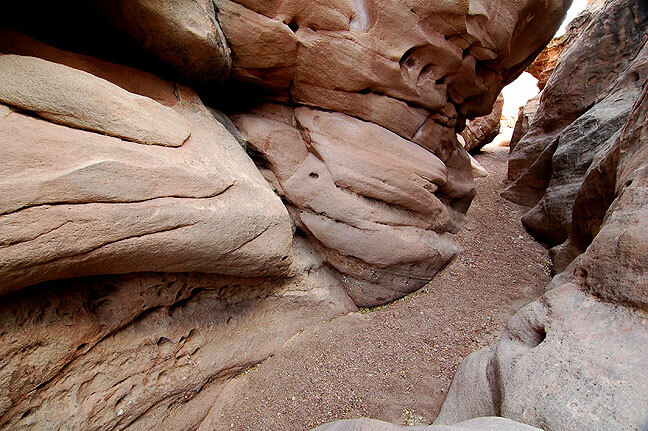 The canyon is deep and wild, curving and meandering. 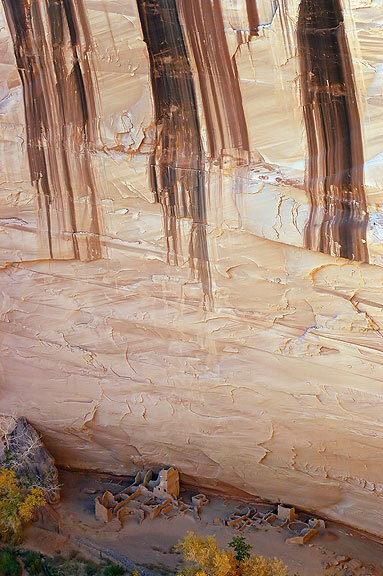 It’s about 600 feet deep, but I only descended about half of that, since I was alone and was not prepared to negotiate any of the serious obstacles that a seasoned canyoneer might. 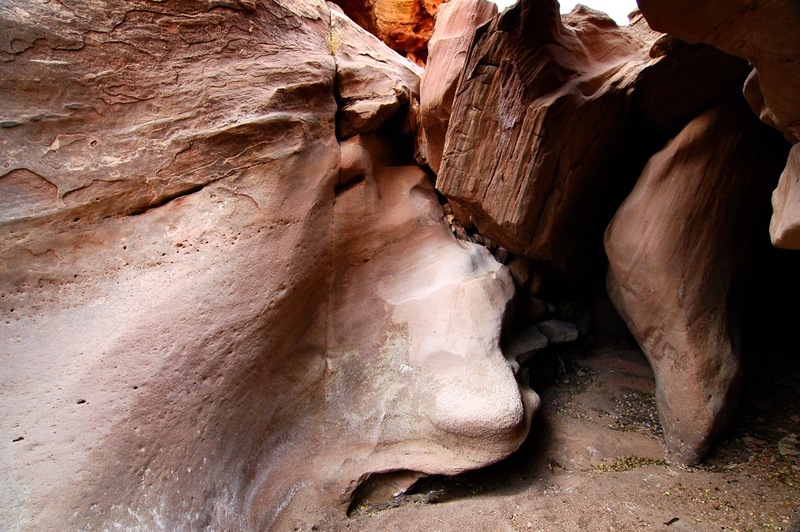 Though The Black Hole at White Canyon is regarded by some as a Holy Grail of canyoneering, I wasn’t equipped or prepared to make an attempt at it. I admired the scenery and marked it on my map, then moved along. 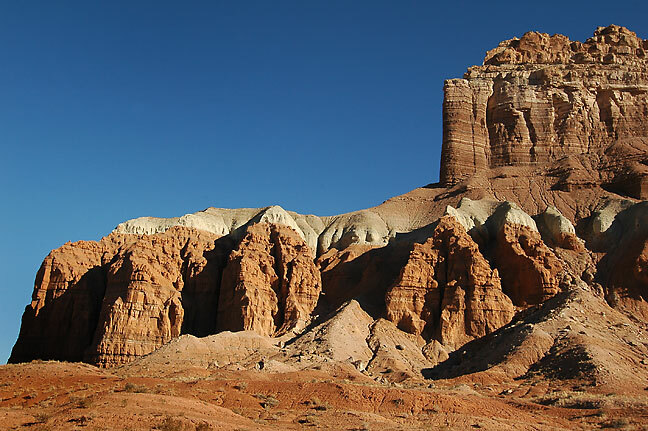 I found this handsome desert scene along Utah 95. I made some passable images, then hiked out and hit the road. 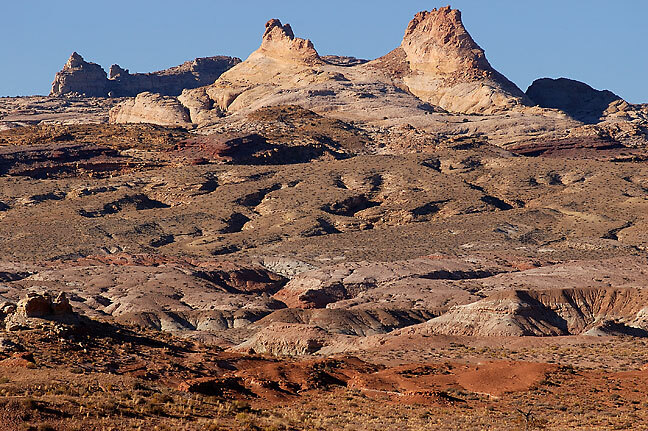 My next stop was the San Rafael Swell, a desolate and wild area in central Utah that appeals to those like me who crave solitude and adventure. I hiked my two original target trails, Ding Canyon and Dang Canyon. They can be done as a loop, but I found obstacles that I was not comfortable attacking while hiking alone, so I only went some of the way up both canyons. Dang also included wet crossings, and I don’t care for the water. Still, the areas I saw were spectacular. 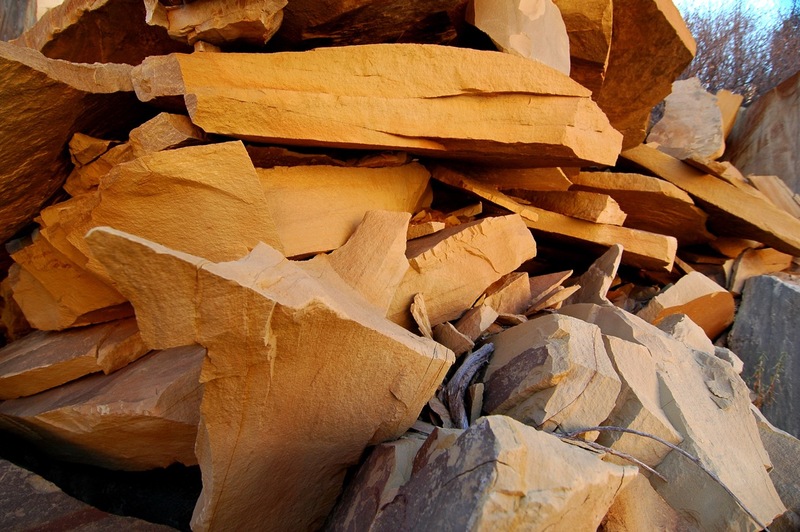 This rock pile is visible on the approach to Dang Canyon. Not far up Dang Canyon I found those potholes full of water, and decided I wasn’t up for getting wet. Ding Canyon is wild and beautiful. 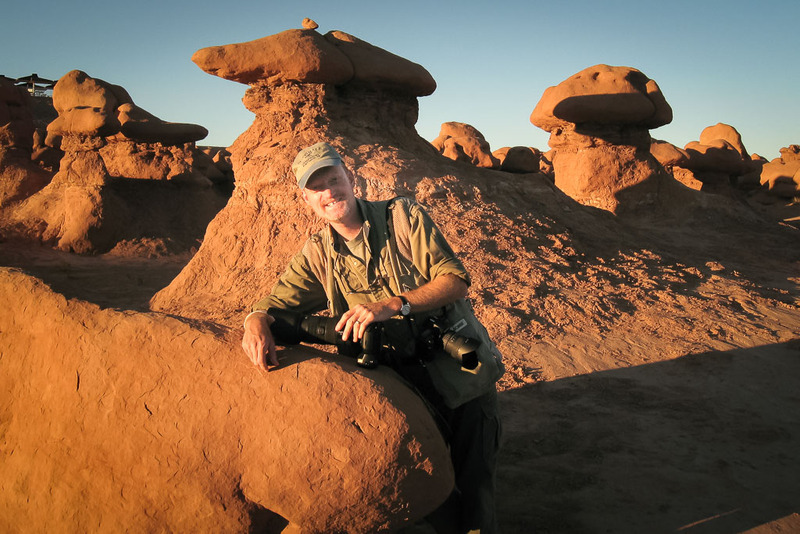 The author poses in Goblin Valley. By late afternoon I was looking for a sunset opportunity, so I made my way over to the nearby Goblin Valley State Park. I hiked a couple of their short trails to kill time, and was in the main valley for the last light. 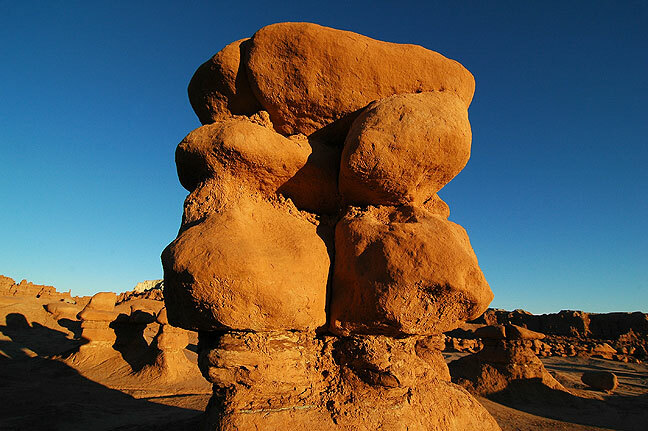 This is The Three Sisters formation near Goblin Valley. In the distance is Temple Mountain. 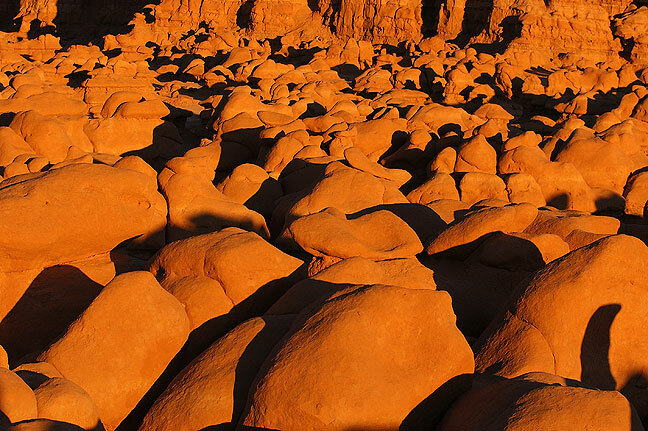 The heart of Goblin Valley at last light. 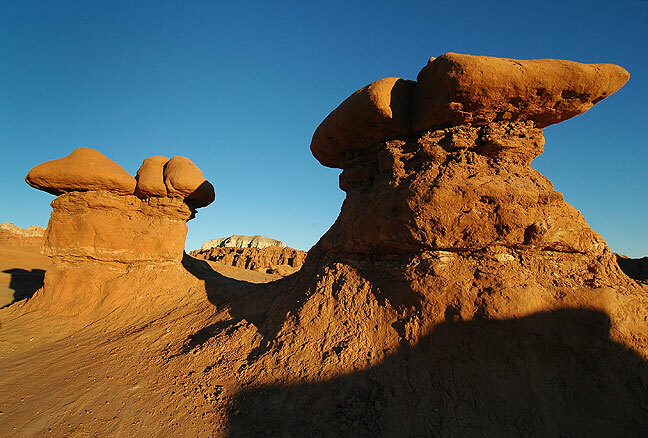 Goblin Valley at last light. Last light lines the Henry Mountains from Goblin Valley. 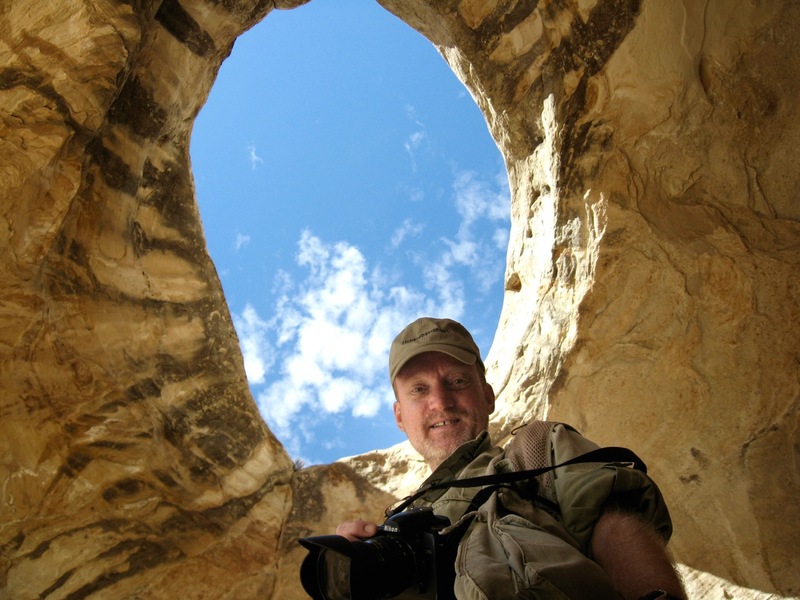 Your host poses in an alcove in Wild Horse Canyon. Thistle, Wild Horse Canyon, San Rafael Swell. 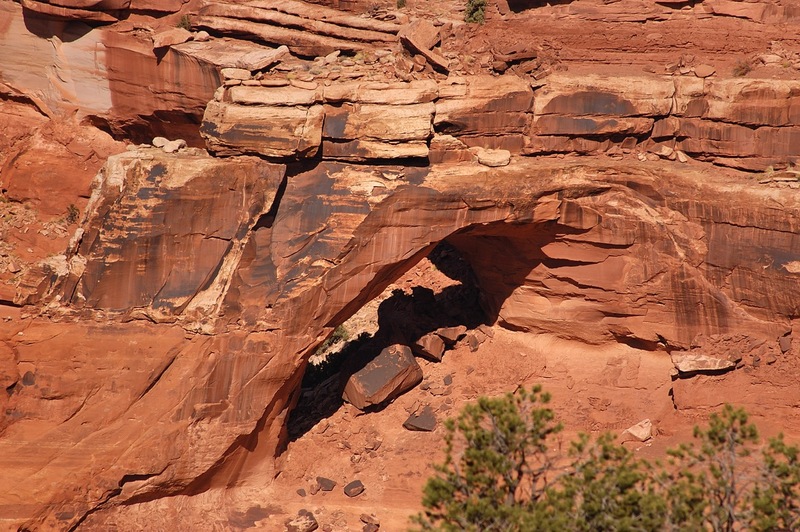 The Wild Horse Window is huge and impressive, but difficult to show to scale because there are no humans near it. Your host poses with the Wild Horse Window directly above him. 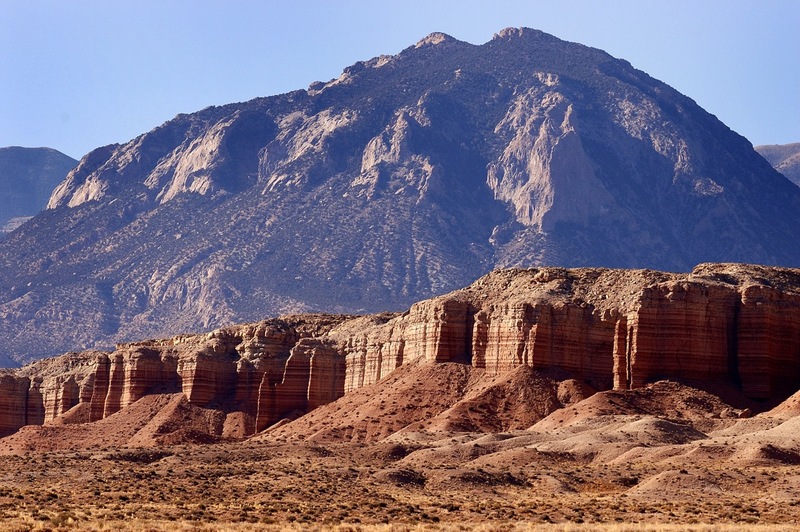 The San Rafael Reef forms the eastern escarpment of the San Rafael Swell. After my hike at Wild Horse, I was starting to get frustrated by the lack of suitable trail markers or road signs. 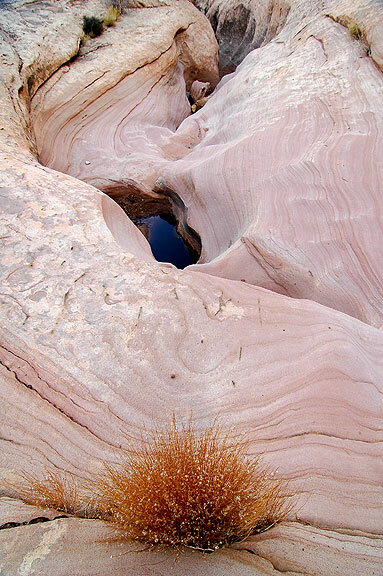 The area was originally developed by uranium mining, and is now administered by the Bureau of Land Management. 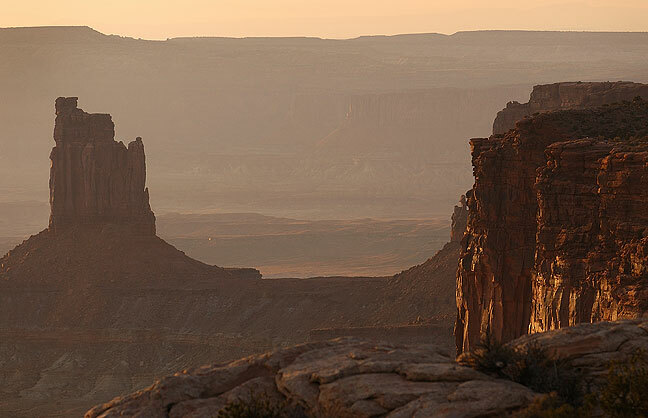 In the back of my mind, I kept hearing the call: Canyonlands. This national park might be my favorite place on earth, and by afternoon, I was there. 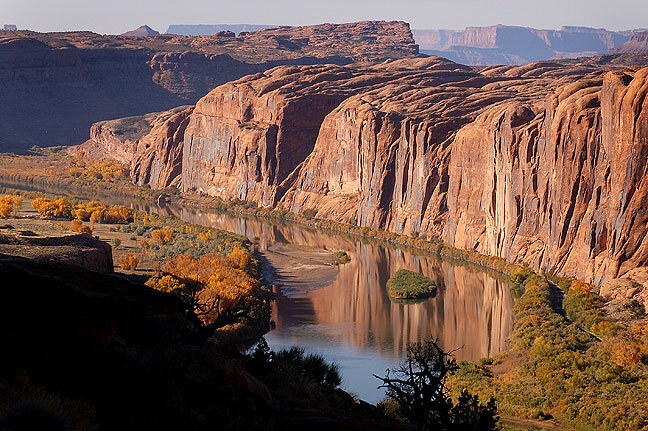 A friendly park ranger suggested the Lathrop trail, which leads south through an open pasture to the the rim of the Island in the Sky district, then descends to the Colorado River. I only had a couple of hours of daylight, so I hiked as far as the rim, then returned, for a total of about five miles. 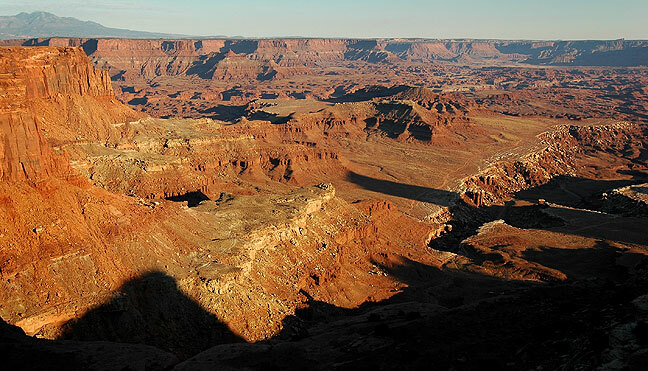 This overview from Canyonlands’ Lathrop Trail looks southeast toward Hatch Point. 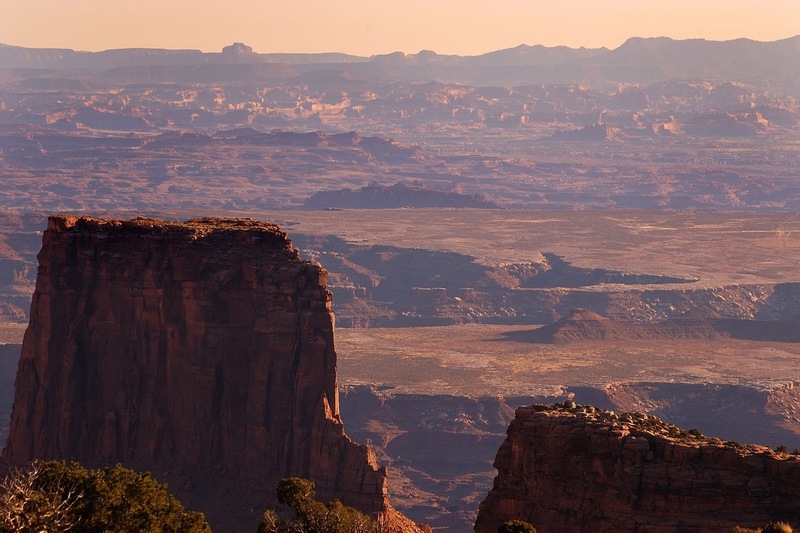 This view of Canyonlands looks southeast from the Lathrop trail. Sunset over the Colorado River, Canyonlands, and Hatch Point from the Lathrop trail, Island in the Sky district, Canyonlands. Near the canyon edge on the Lathrop trail, this view stretches many miles to the Abajo Mountains in the distance. 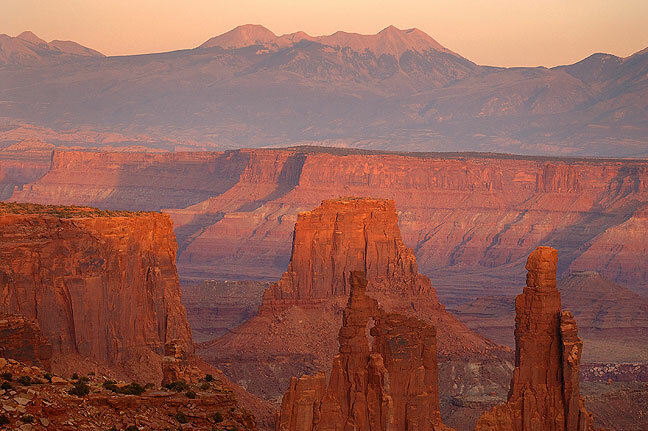 Sunset from the Lathrop trail showing Lathrop Canyon, Island in the Sky district, Canyonlands. Tree and Hatch Point from the Lathrop trail. This 300mm view from the Lathrop trail looks far to the south. 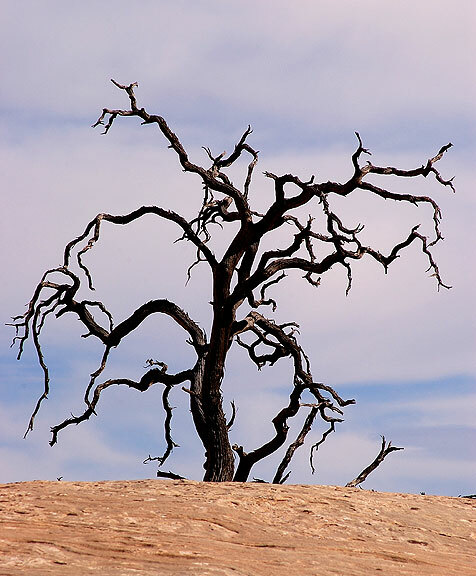 Dead tree at last light, Lathrop trail. Last light graces to top of a rise on the Lathrop trail. Last light on sandstone pinnacles, Lathrop trail, Canyonlands. By the time I got back to the grassland part of the Lathrop trail, it was dusk. 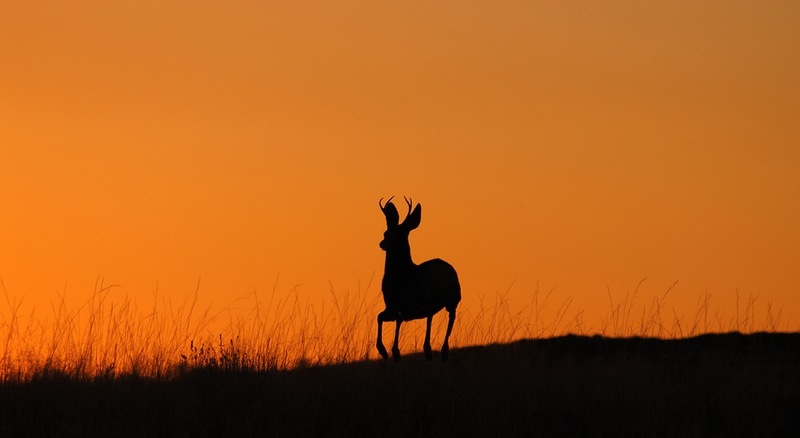 I spotted this animal on the horizon after sunset on the Lathrop trail. In the morning, Neck Spring Trail, a 5.8-mile loop with a lot of variety: woodlands, open slickrock, two active springs, and a steep climb. Prior to the hike, two guys from New Mexico took my picture, and told me that the best way to do White Sands (New Mexico) is on a summer night with a full moon and a watermelon. It sounded pretty cool. The Neck Spring trail passes over “the Neck,” a narrow portion of the Island in the Sky surrounded by precipitous drop-offs on both sides. 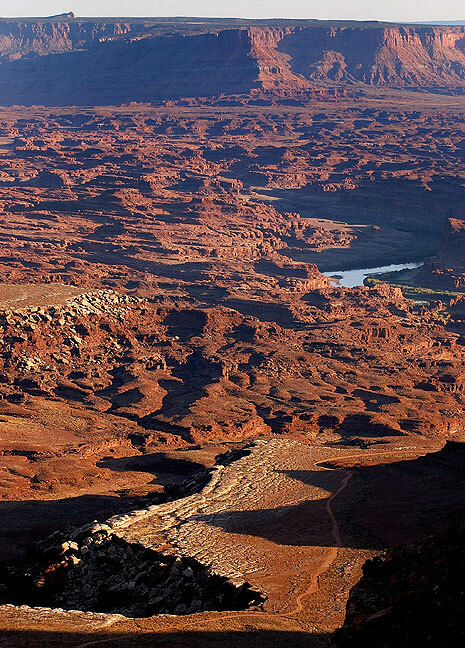 This view looks east with the White Rim Road visible below. 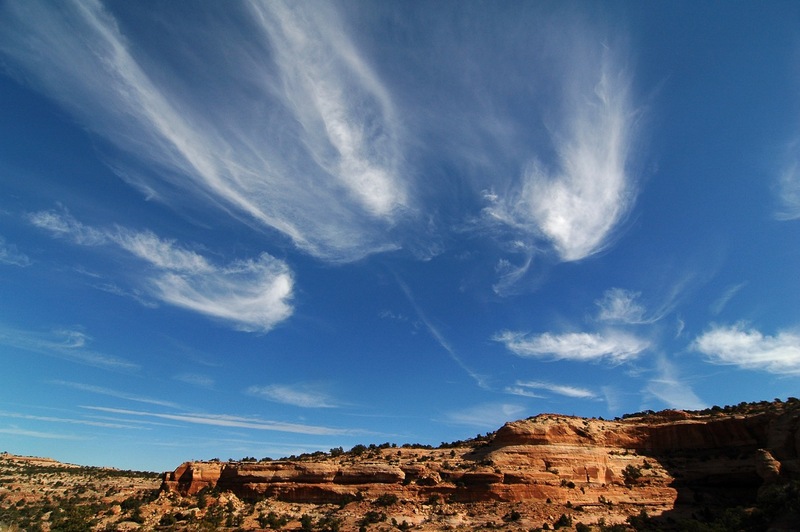 Cirrus clouds dance high above the Neck Spring trail. 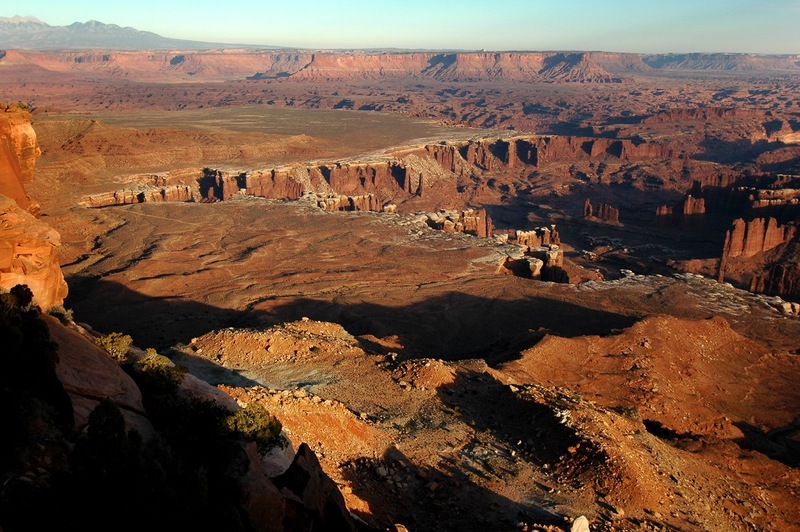 At midday, a friendly ranger named Kass gave a nice 15-minute program about the origins of Canyonlands. 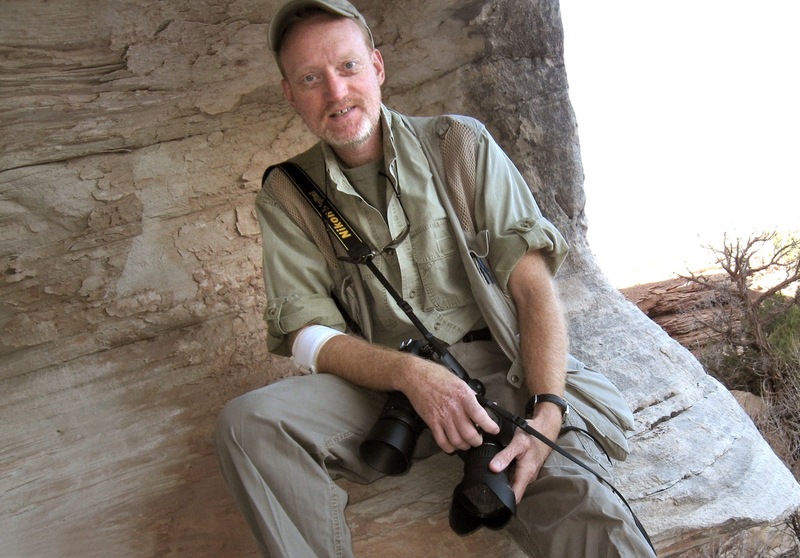 While we were waiting for Kass before the program, a nice Australian woman named Jo mistook me for the ranger, undoubtedly due to my rugged attire. I was very flattered. She and her friendly husband Graham, from Melbourne, came to the states, bought an RV, and are spending 18 months touring the country. I told them that they are living a fantasy that Abby and I dream of often. 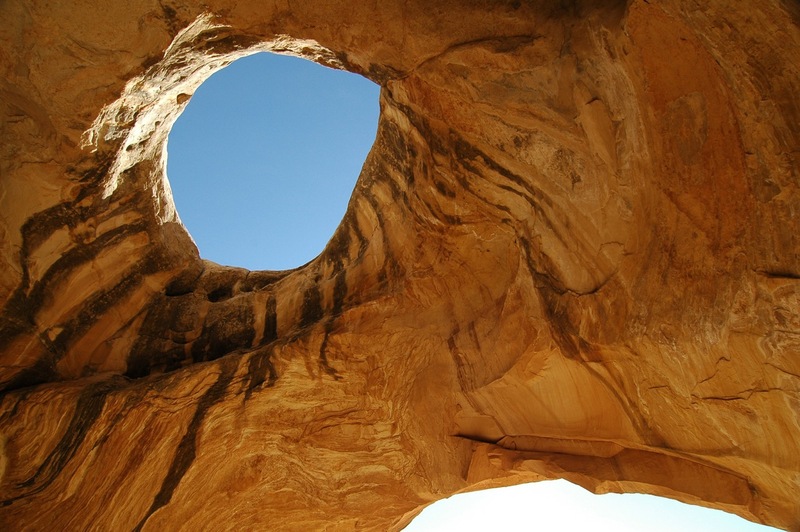 About halfway through my hike on the Neck Spring trail I saw this, which looked very much like a natural arch. 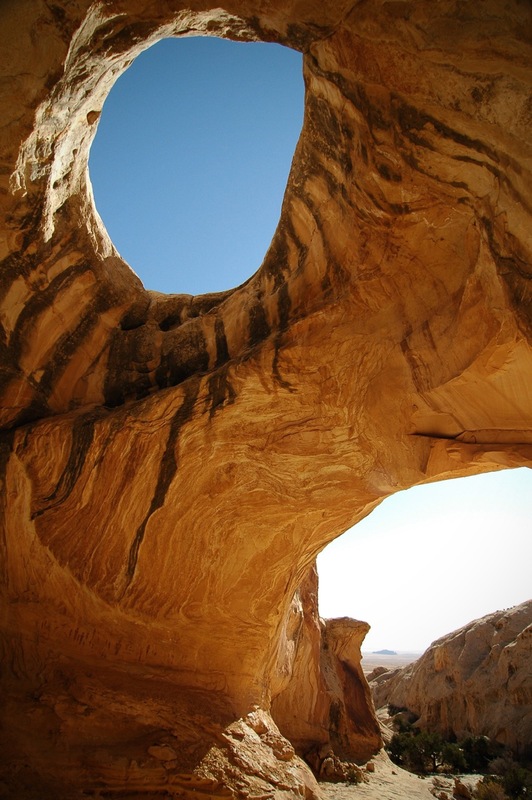 I was later able to discover that the late arch hunter Bob Fagley identified it on his site as Broken Bell Arch. 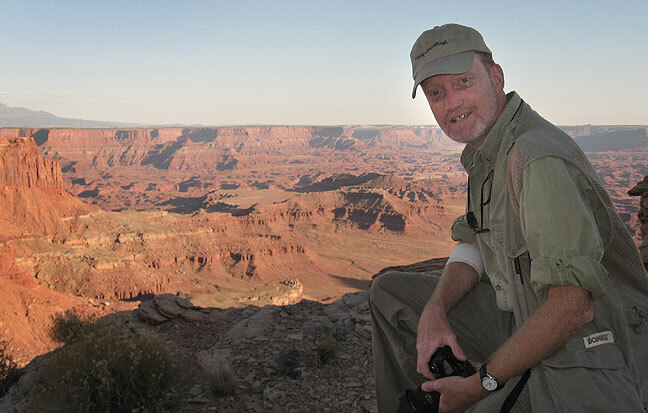 As the afternoon wore on, I made my way down the Grand View Overlook trail, which heads west across a mesa, leading to an overlook of the White Rim and, if you look hard enough in the distance, the Maze District. I dream of one day buying or renting a Jeep and visiting the Maze, which is regarded as among the most remote areas in the lower 48. I watched the sun go down at Grand View Point, which is always an amazing experience. I sat in silence for 45 minutes or more and took in the quiet and the grandeur. 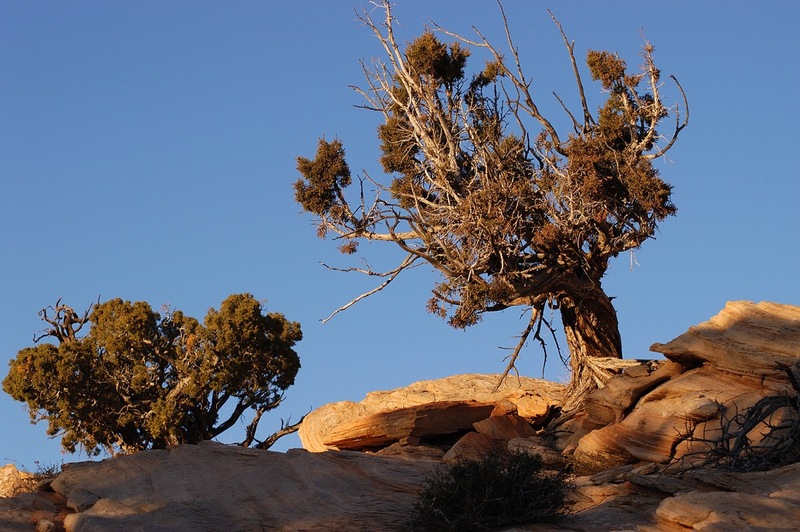 Tree on Grand View Point trail, Canyonlands National Park, Utah. 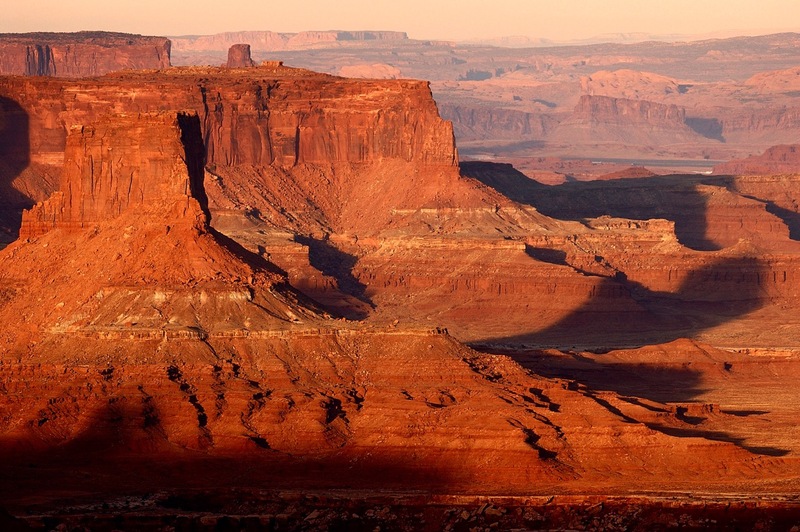 Grand View Point trail, Canyonlands. 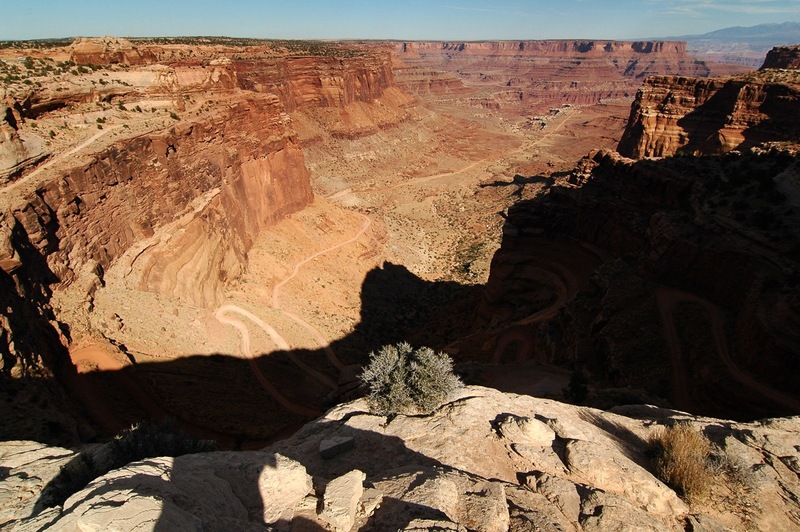 Monument Basin from Grand View Point trail, Canyonlands. 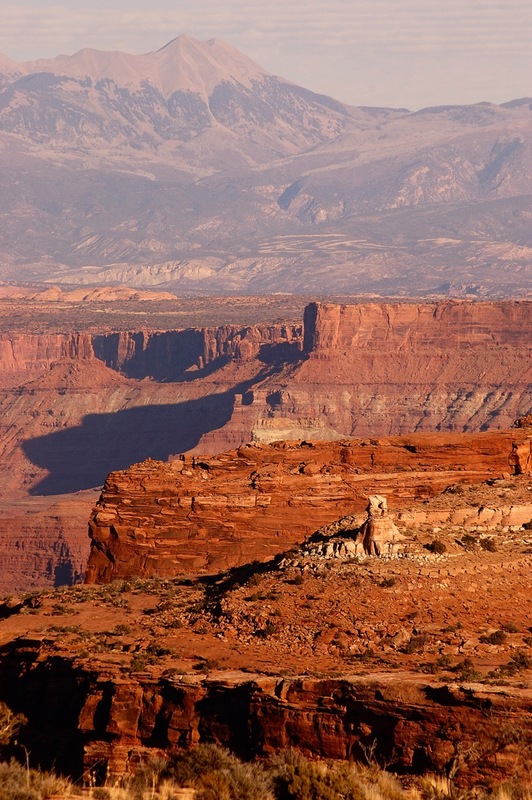 The Grand View Point trail rivals most in the American Southwest in terms of sheer majesty. This view looks south-southeast toward Hatch Point. 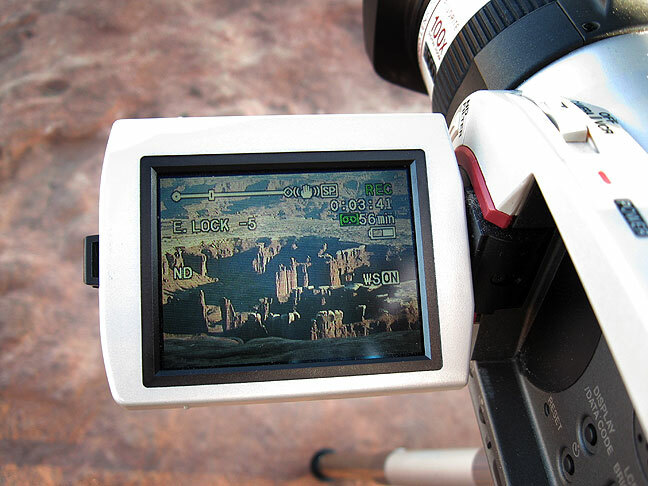 My camcorder makes a 40-minute time-lapse sequence of sunset on the Monument Basin area of Canyonlands National Park. As I was leaving the park, the thought crossed my mind that I might catch some last light on Mesa Arch, so when I got to the trailhead, I bounded out and practically ran the quarter-mile trail. I got there in time for a couple of really nice images with gold light hitting the features in the background, and mellow blueish-purple light on the arch itself. Those who photograph this signature piece of the Island know that it is mostly photographed in the morning, so it was nice to get some unusual light on it. 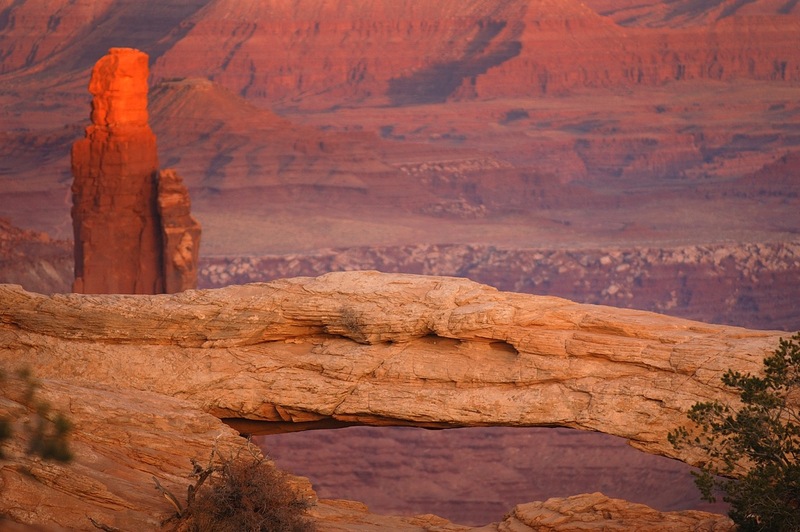 Mesa Arch just after dusk, Island in the Sky district, Canyonlands. 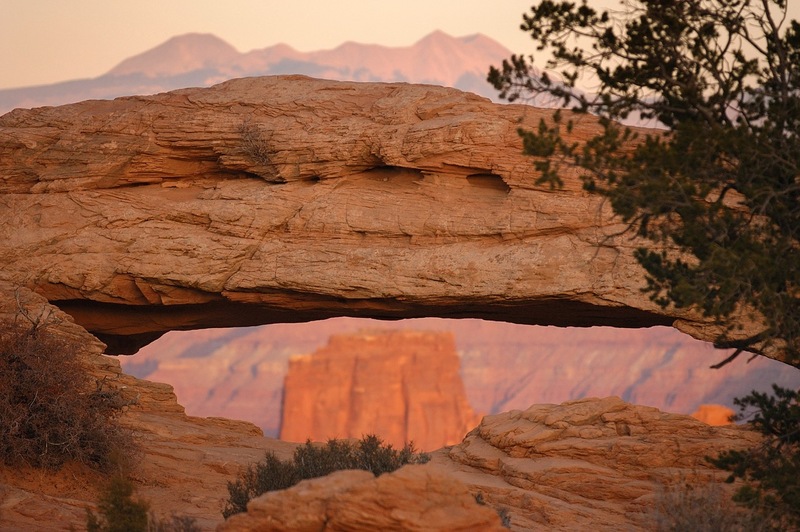 Mesa Arch with Airport Tower in the background, Canyonlands. 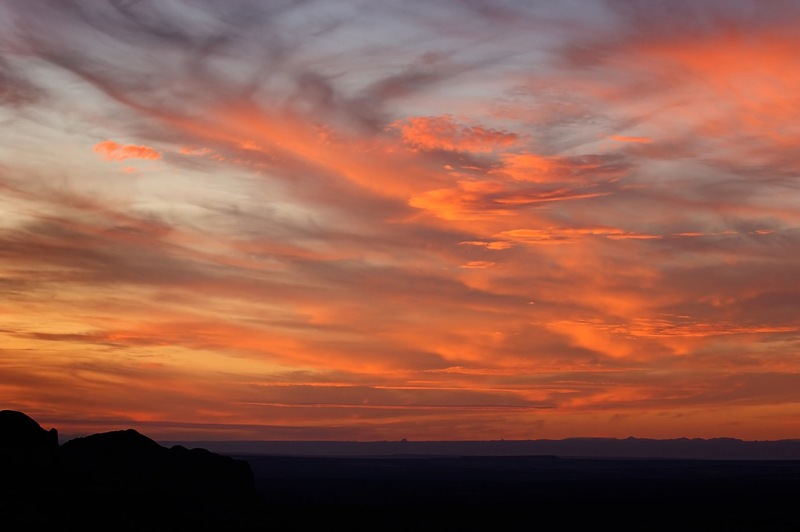 Mesa Arch and Monster Tower, sunset, Canyonlands. After that I was driving near The Neck when the sky absolutely caught fire with sunset light, and I stopped and shot it. It was an excellent way to end the day. I woke up in Moab wondering what to hike. I felt certain that if I just drove around for a bit, I’d find something, and before long I proved myself right. I ran into a friendly couple who were hiking up the Moab Rim Jeep Road, and they highly recommended it. It starts at the Kane Creek road behind the cliffs you see when you come into Moab from the south, ascending 1000 feet in 1.1 miles to a nice overlook of the whole Spanish Valley, including the City of Moab. 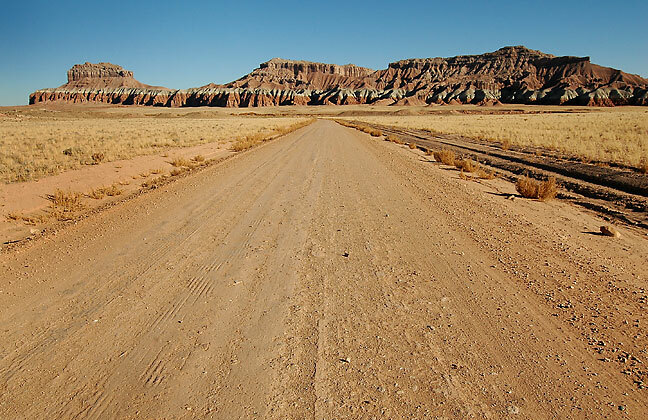 This Jeep road continues on for some miles into the Behind the Rocks Wilderness Study Area. 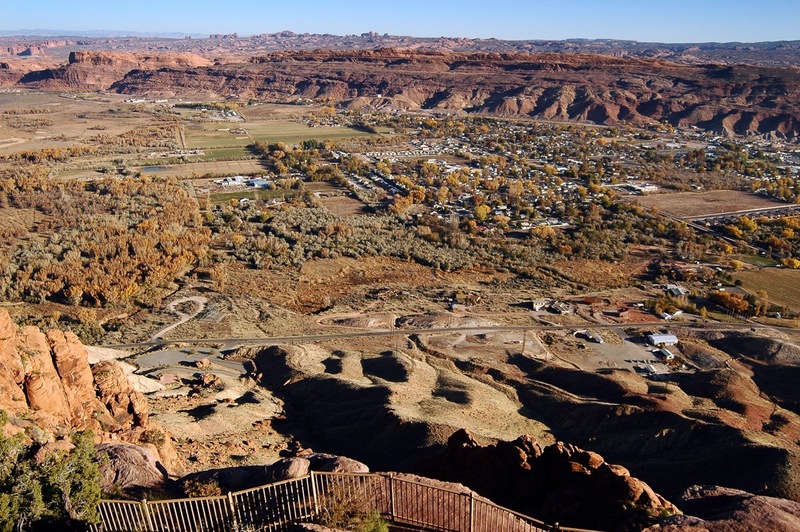 The City of Moab, Utah is laid out before visitors to the Moab Rim, with Arches National Park on the horizon. On my way back down, I ran into a nice girl hiking with her three friendly dogs. I also encountered two Jeeps and a pickup making their way up the road, which the sign at the trail head cautioned was a “4+”, meaning most difficult. By the time I got to the Jeepers, they were attempting to ascend one of the difficult obstacles, and not soon after that one of them gave up and parked his vehicle. 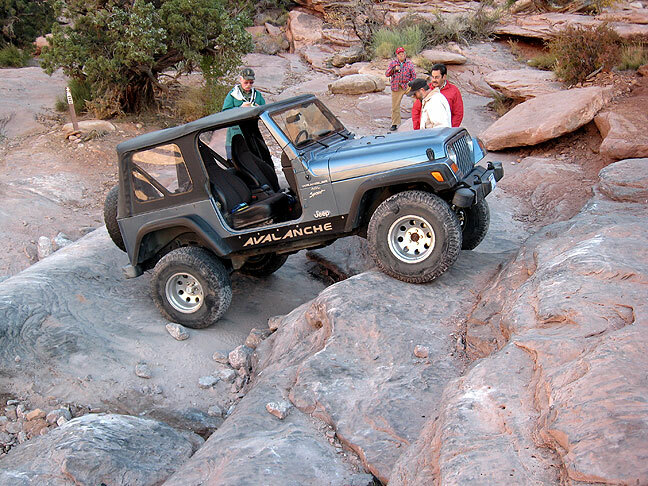 Jeep drivers attempt to ascend the Moab Rim Jeep Trail, one of the most difficult in the area. 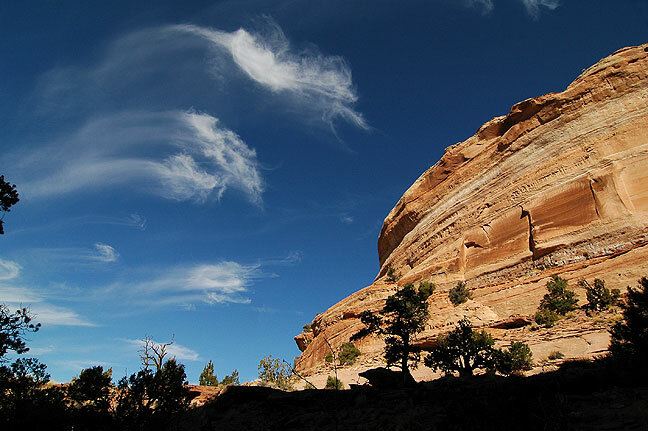 By the middle of the afternoon I was at Canyon de Chelly National Monument, where I drove to the Antelope House Overlook, which I had never seen despite visiting the canyon many times, including on our honeymoon. I met three nice ladies from Virginia, who asked me to take their picture and then took mine. I gave them a richardbarron.net web site card, and one of them told me, “You live in the crossword puzzle clue city!” (Ada). • The hiking was excellent. November is a superb month for trips like this, since it is cool, usually clear with good sunsets. 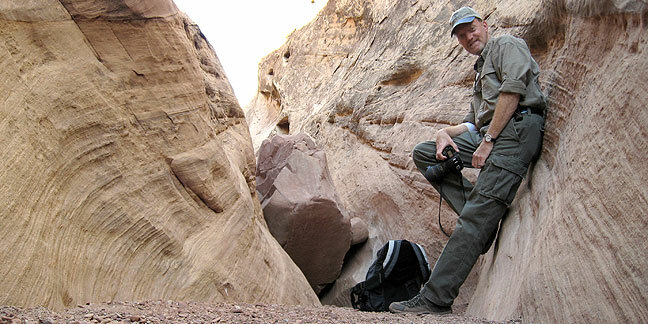 • As much as I admire the San Rafael Swell, I am increasingly frustrated by the lack of signage, the indefinite and often misleading network of trails, and the rough, unmarked roads. • I missed my wife. I take a couple of trips alone each year because Abby isn’t up for the kinds of demanding wilderness hiking that I love. I think about Abby with every step on every trail, though. 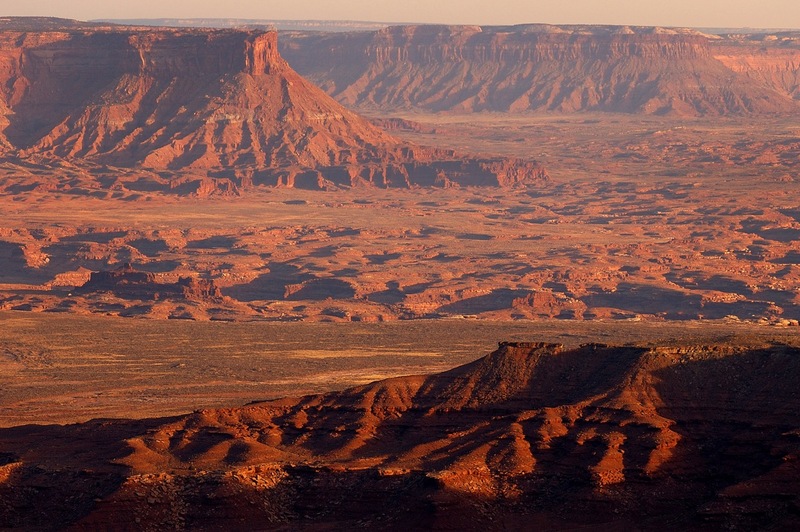 I want to introduce her to Canyonlands soon. 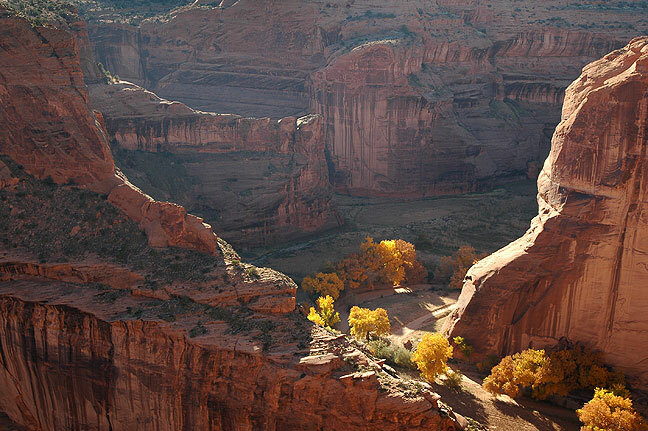 Road, Canyon del Muerto, Canyon de Chelly National Monument. Badlands and small mesa, northern Arizona. This bleak stretch of land along U. S. 191 has a spooky, otherworldly quality about it. 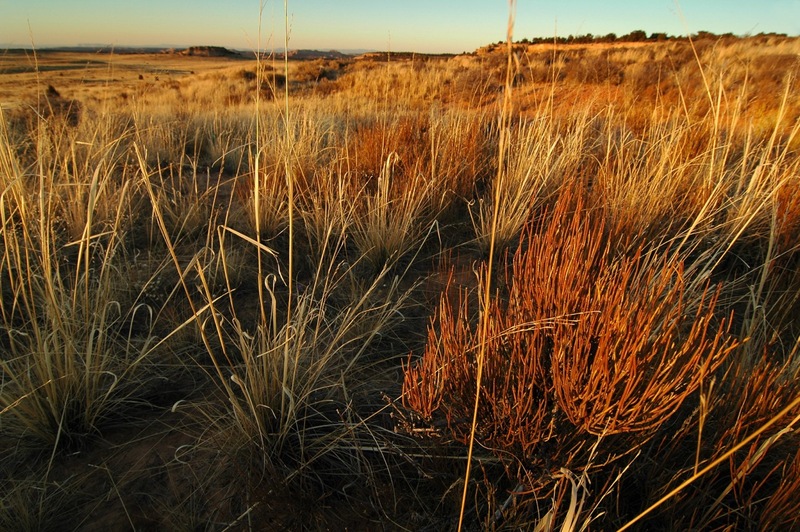 Unlike the deserts of Utah or New Mexico, this expanse seems too lonely, too empty somehow. I find that my images only express a fraction of how I feel as I pass through. Fence and pinnacle, U. S. 64, northern Arizona. Red earth badlands, U. S. 191, northern Arizona. Red earth badlands and U. S. 191, northern Arizona.